Elevating Platform offers safe access to tank trucks/cars. G-RAFF Elevating Platform provides safe access to tank trucks, tank cars, and hopper cars. Specifically providing operators with continuous fall protection while working on the tops ofÂ such vehicles, self-supportingÂ product featuresÂ level access platform that raises and lowers to exact height of vehicle. Other features include machine screw actuation, pushbutton operation, andÂ self-adjusting stairway. Customization is available to suit specific requirements. Benko Products, Inc., the industry’s leading fall protection equipment manufacturer for tank trucks and hopper cars, is pleased to announce that its G-RAFF Elevating Platform provides safe access to tank trucks, tank cars and hopper cars. The G-Raff Elevating platform is part of the “GREEN Access & Fall Protection” line and was specifically designed to provide operators continuous fall protection while working on the tops of these vehicles. The G-Raff Elevating Platform is self-supporting and features a level access platform that raises and lowers to the exact height of the vehicle. Other features include: machine screw actuation, push-button operation, and a self-adjusting stairway. 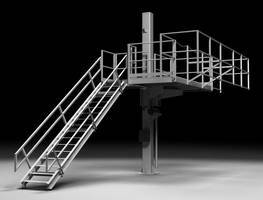 The G-Raff Elevating Platform can be easily customized to suit your specific needs. The GREEN Access & Fall Protection product line includes flat ramp, telescoping, and self-leveling stair gangways, truck and railcar loading racks, stationary and portable platforms, loading / vapor arms, spill containment pans, portable transloading carts, horizontal lifeline systems, caged ladders, pipe racks, custom structural, and more! All GREEN platforms are engineered for operator safety, compliance with governing O.S.H.A. standards and for your specific application. For over 30 years, Benko Products has established itself as a manufacturer dedicated to providing innovative, quality, cost-effective solutions for various industrial material handling applications. All manufacturing is done at Benko Products’ state-of-the-art manufacturing facility in Sheffield Village, OH. The end-user has constant access to Benko's extensive engineering sales support experts, guaranteeing the fastest lead times in the industry. When it comes to patented technology, experience, unparalleled service and economical solutions: Nobody beats Benko. Height Adjustable Work Platform helps prevent injury. Work Platforms are designed for use with fork lift. Work Platforms are offered with or without outrigger.